Historically speaking, fluid film bearings were the first type of rotary bearing to appear simply because they are more simple than rolling-contact bearings. Early sliding bearings were almost certainly first made from wood after the invention of the wheel in prehistoric times, and these were lubricated with grease derived from animal fat. Metal wheel journal bearings followed. When the industrial revolution began in the eighteenth century, machine rotational speeds reached a point where lubricated metal journal bearings became hydrodynamically isolated so that there was no metal-to-metal contact. 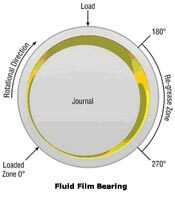 The initial discovery was certainly by accident, but soon an empirical methodology was developed followed by the science of tribojlogy related to journal bearings.